Steph took off toward the north on the 4-wheeler to mark trail, and Carol and I took August and Mac to the south to flag the Hart Creek trail. Rushcreek Mac, a former Rushcreek ranch horse, is not sure he wants to be an endurance horse over a cow-pony yet, but he's for sure still a great gate horse and he's now a great ribbon horse. 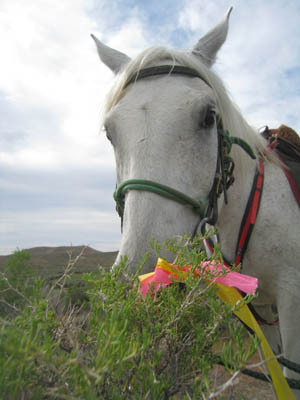 You just have to point him at a gate and he knows how to open it, how to position himself; and it took hanging two ribbons for him to figure out trail flagging. 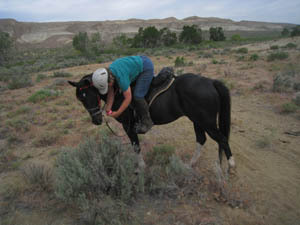 He'd stop as close to a bush as I wanted, and not move a foot, even when I leaned and hung off of him sideways like a trick rider. 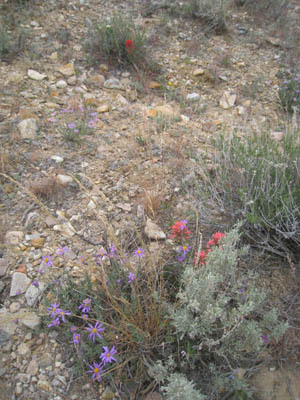 Though it's been a terribly dry spring, there are a few little canyons of bright flowers. At the far end of Pickett Canyon, there are a dozen shades of Indian paintbrush, and just overnight, asters and penstemmons have popped out. Back at the ranch, John and Susan Favro were giving the yard a last mowing and weed-eating. A weather system started blowing in by afternoon, winds kicking up dust so thick you couldn't see the Favros' trailer out the front window. The mountains were whited out by a rainstorm and it smelled like rain... but the rain never made it to the house. The temperature dropped twenty degrees, so it will be in the 60's and 70s for the ride, perfect for the horses, but we'll all be kicking up huge clouds of dust from the dry trails. Neighbor Carol's last mare had her golden foal at 1 AM Tuesday morning... when you pass by Lost Juniper Ranch just before you get to the Teeter ranch, check out the 3 golden babies by her cremello Quarab stallion in the pasture to your left.